Got an update on this photo near Quinn's Hot Springs that was chosen to promote Montana Tourism. It's currently being placed on the sides of Busses in Chicago, Seattle and Salt Lake. They are also using it in a page and a third ad in the National Audubon Society Magazine (see attached partial), in the coming months. It will also be included as a header for a video ad at the top of Yahoo's main News page and main National Geo. web page. It will also be included in the Chicago train station and 26 other locations around the country. It also has been chosen by the Rocky Mountain Elk Foundation for their Chapter catalog. Sooo... exciting!!! 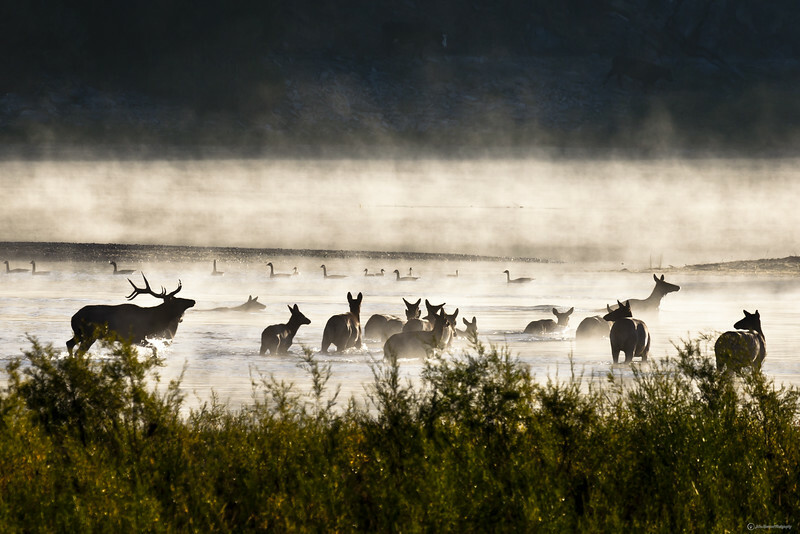 Elk in the mist on the Flathead River near Quinn's Hot Springs. A voice tells me to put on my telephoto lens 15 min. before seeing Elk. A voice tells me to turn my head hard right as I am driving and I spot two cow elk stepping into the misty river. I turn my eyes back to the highway where there just happens to be a pullout for me to stop. There just happens to be a clear path for me to run to river's edge among swamps and fences. The fog illuminates as the sun is just beginning to rise. The elk are 200 yards out and almost across the river as I arrive at the rivers edge. A voice tells me to bugle with my mouth and despite my doubt that they will hear me I am obedient and they return to within 100 yards. Ducks and geese come out of nowhere and begin swimming in the background as I am shooting pictures. The elk stick around for ten minutes giving me many opportunities to take shots and adjust my camera and shoot again with a final silhouette pose by the bull as he pushes his cows around the end of the island. Due to the poor lighting conditions of first daylight, the shutter speed was well below accepted limits for a hand held telephoto without getting motion blur. However, I ended up with 80 stunning shots out of a 100 despite those limits. This area is not known for elk and locals say at-most they pass through here twice a year and after 40 plus years of constant travel on this highway I had never seen elk in the area before this. After taking the last picture I sat down with tears of joy streaming down my face, and thanked God for the Miracles in the mist as I realized only he could have orchestrated this photo shoot.